An energy-efficiency upgrade made Lee Tidwell’s Compton home more comfortable on hot summer days. Energy efficiency helps a retired day-care worker keep cool in 90-degree heat. It’s warming up outside as midday approaches the Compton neighborhood, just south of downtown Los Angeles. But it’s comfortable in 67-year-old Lee Tidwell’s home, where she sits with her daughters buzzing around her, one doing a college assignment on her laptop at the kitchen table and one watching TV in the living room. With more and more days over 90 degrees in the summer, new windows and added insulation Lee just installed as part of an energy efficiency upgrade make a huge difference in keeping this family comfortable and keeping street sound out, Lee says. Lee has lived in this house for 25 years and has seen the neighborhood—notorious for gang violence—change, mostly for the better, in recent years. “I guess I would call it a poor area, or a socio-economic low-income area,” says Lee. “When I moved here it was a new area and people were keeping up their yards, but things changed. You would hear about carjackings and there were a lot of gangs around.” At one time people were afraid to call the police, she says, but the Sheriff’s Department has done some big sweeps and moved a lot of the gangs out. “I haven’t heard anything about a drive-by shooting in five years,” she says. Still, Lee has security cameras outside and four views show up on a TV monitor near the door in the living room. Lee wears an elegant set of pearls and bobbed silver hair. Her three-bedroom home is beautifully kept and cared for. Potted patio plants and thriving bougainvillea surround her neatly trimmed yard and a tall perfectly pruned red rose bush looks stunning next to the pastel green stucco of her home. Lee has spent time, money and effort keeping up her home and yard over the years, including an addition in the back for her home business. “My kids were small and I took care of them and did family daycare here for 20 years,” she explains. She has four children of her own and was licensed for 14 daycare kids. She served families in this neighborhood in Compton. Many of the parents worked at nearby Martin Luther King, Jr. hospital. She was able to let some low-income families in at a lower rate because of a county program that provided financial aid. Three of Lee’s kids currently live at home while they attend school full-time. Patricia is 22 and an art major at El Camino Torrance Art Program. Jasmine, 21, got married in January and she and her new husband Ray Anthony are staying with Lee while they save for their own home. On top of school, Jasmine has a summer internship in occupational health. Ray Anthony’s job in security helps Lee with the bills. With all of them in the home until they finish school, their air conditioning was running about $190 in the summer and it’s likely only to get hotter and more expensive to keep cool, according to recent research. A new UCLA study published in the Journal of Climate shows L.A. will be in for a record number of days with extreme heat. This is the kind of climate impact to its citizens California is working to prevent with a set of important laws. AB 32, the Global Warming Solutions Act of 2006, requires California to reduce its greenhouse gases that cause global warming and charges polluters for what they put into our air. Additional laws devote 35 percent of those funds to projects that benefit disadvantaged communities like Compton and to help low-income residents around California benefit from clean energy and energy efficiency. “We haven’t had a winter this year. We skipped winter. We have a heat wave two or three times during the summer. You can’t help but wonder what’s going on,” Lee says. So when the Community Development Commission (CDC) in L.A. sent a brochure in the mail advertising energy efficiency upgrades, Lee signed up to help lower her cooling bill and make her home and family more comfortable. Through the CDC she installed new, energy- efficient windows, insulation in her attic and a highly efficient tankless water heater in her garage. The upgrade came to her through CDC’s Single Family Home Improvement program. SFHIP, designed to help low-income qualified owners who earn 80 percent of the county median income or less. SFHIP works with the statewide Energy Upgrade California program to provide rebates for residents who do energy efficiency improvements. 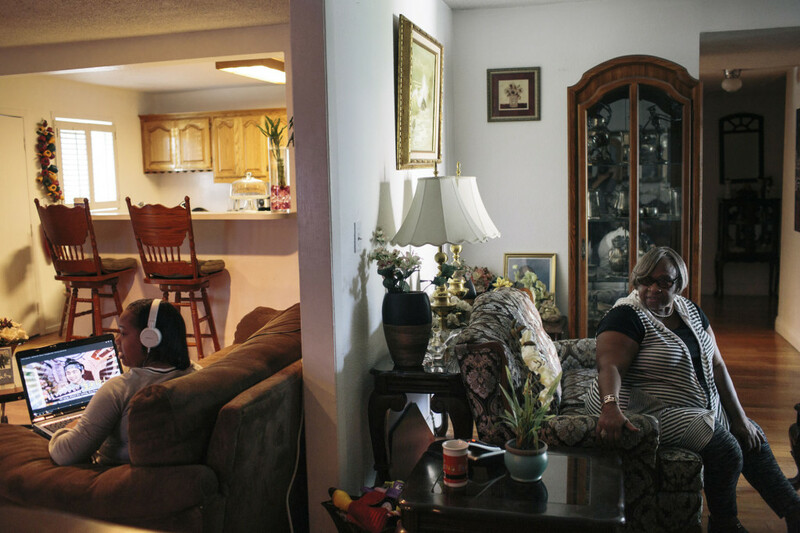 Lee Tidwell, right, sits and her eldest daughter Patricia Tidwell spend time in their home in Los Angeles. 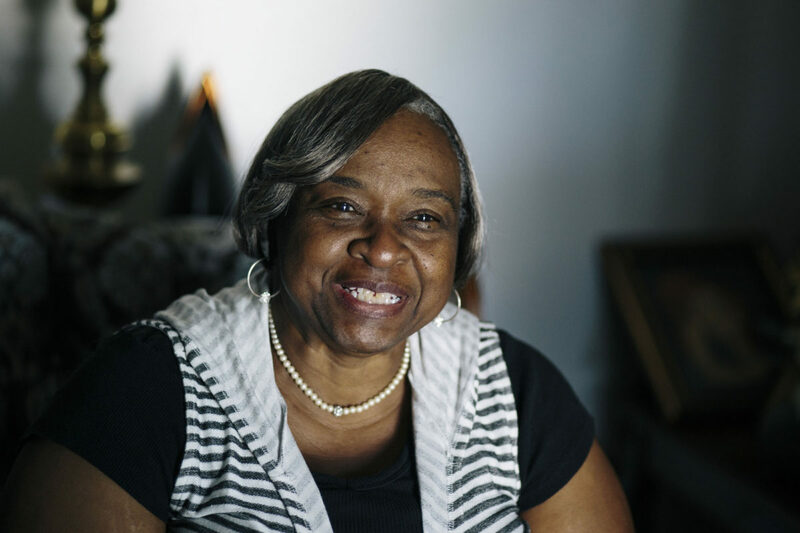 Tidwell received an energy efficiency upgrade to her home in the Compton neighborhood of L.A., which inluded a $3000 rebate. Tidwell used the money to pay for her youngest daughter’s wedding in Las Vegas. Lee was surprised later when a check for $3,000 came from her utility. “I didn’t know about the rebate,” she said. CDC had filled out the paperwork for the efficiency rebate program, paid for by utility customers, for her. She had already folded the cost of the improvements into her home loan, and so she was able to use the surprise rebate to pay for Jasmine’s and Ray Anthony’s wedding. Since they are both in college full-time and saving for a home, they didn’t have the money for much of a wedding celebration. “I was planning on going to the courthouse. I was a little upset because that’s not how I imagined it. Ray was a little upset because he wasn’t able to give that to me,” Jasmine recalls, pulling up some wedding photos on her laptop. Jasmine and Ray Anthony were married January 13, 2015 at Treasure Island in Las Vegas, a great day and unexpected celebration for their family and friends. Even though Lee retired in 2011, as the family matriarch she continues to take care of everyone as they launch their careers. She just had cataract surgery and has arthritis and knee trouble, so she’s taking it easy this summer. Surrounded by dozens of framed photos of her kids—prom, graduation and school pictures on shelves, she offers her forecast for the upcoming season. “It’s going to be hot this summer,” Lee says.